Last week I told you that I was going to knit some stocking for my children. This is daughters. Oops, I ran out of wool with a lot further to go. No chance of buying more, so I had a choice to make, and no, I wasn't going to rip it out and start again. I consulted with daughter, and she agreed to a design modification. I would take the cuff off and use that wool to finish the foot and then use a contrasting colour for the toe and new cuff. I was at my parents again for a few days last week, but forgot to take the double pointed needles for the toe and couldn't find any at the local department store. Drat, knitting put on hold. When I got home on Saturday evening, I searched out the required size and set to work. I added the diamond motif to the top the of the foot. I think the brown sets the gold off very nicely. Measures 9 inches across the top and 20 inches from toe to cuff. Pattern not available. Using the same basic instructions, I have started a stocking for son. 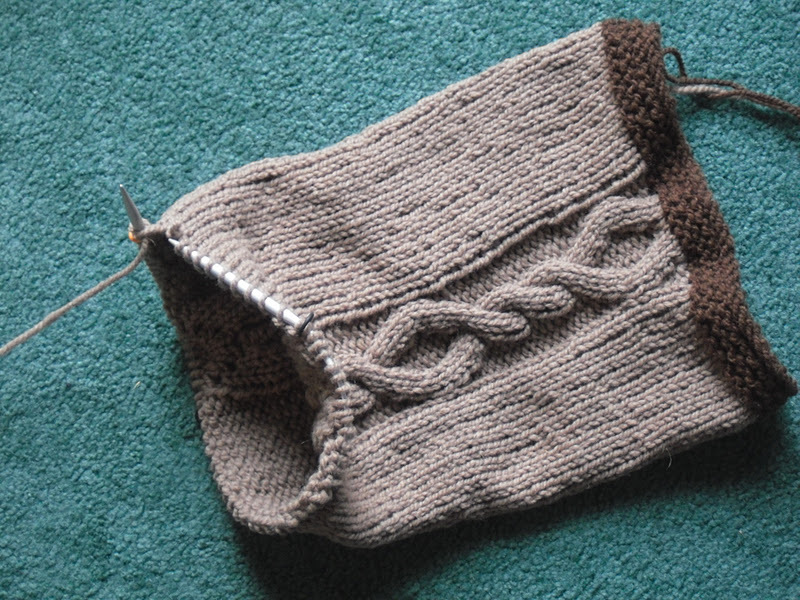 Since I already know I won't have enough wool in the light brown, I am using the dark brown for the cuff and toe. I tried to use a different cable pattern from the book, but the instructions were not for the cable shown in the photo so I had to change it on the fly. I think this one looks quite masculine. 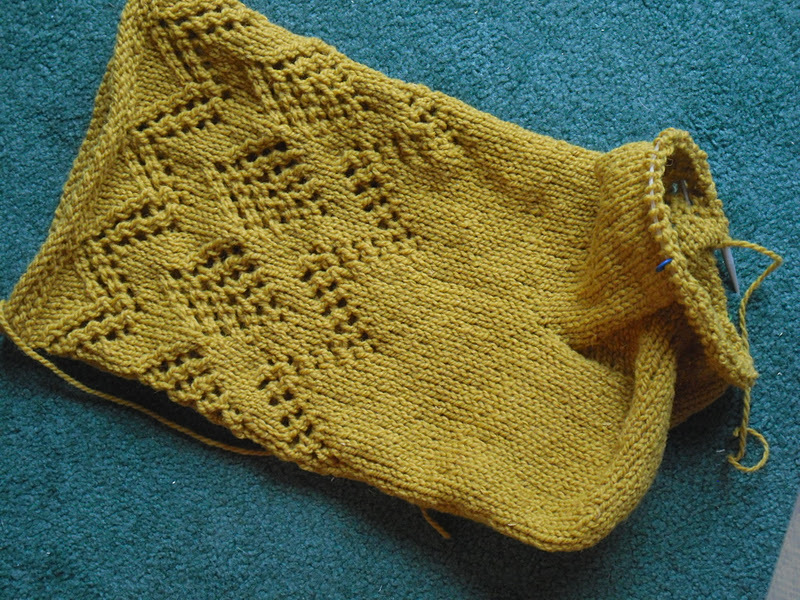 A few more inches and I'll be ready to turn the heel. 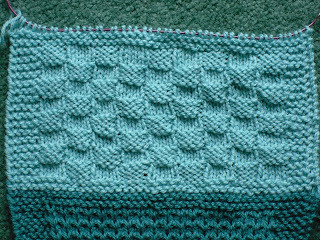 While watching television with my parents, I was able to get pattern six knit on my scarf. This is called Chequer Board with the old fashioned spelling but with a modern appeal. 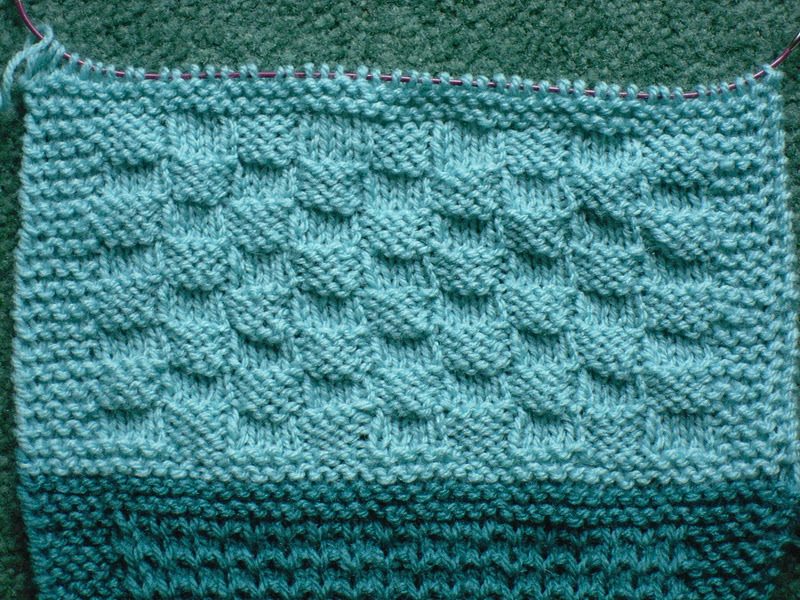 Cheryl, over at The Kingdom of Coco, now has the seventh stitch pattern up for the Papa Bear Sampler Scarf. We're over half way there. Yippee. While I was staying with my parents, mom and I took the opportunity to visit one of her favourite quilt shops. The Marsh Store, located in Coldstream, is a short drive north-west of London, Ontario. I had no specific project in mind, so was open to all that was on display. I was intrigued by this panel. 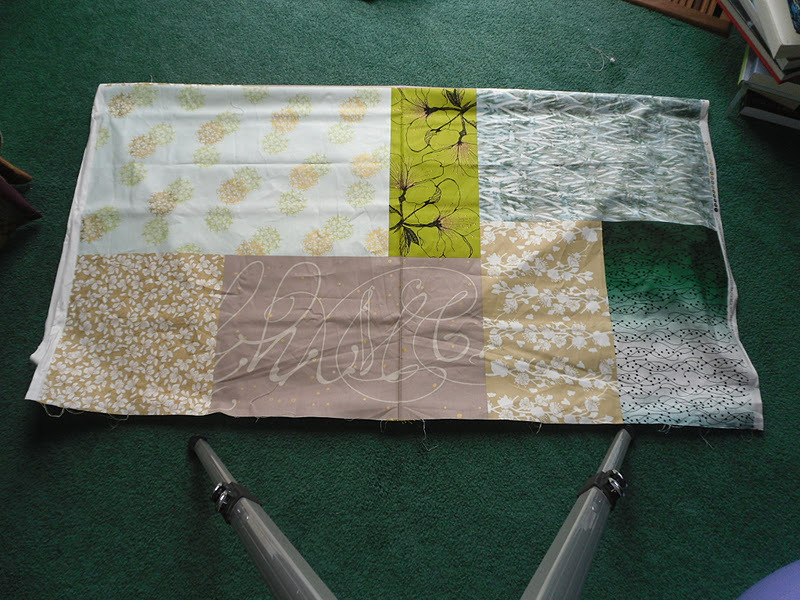 It measures the full width of the fabric by 18 inches and they are seven prints in the panel. I bought the rest of the bolt, which was three panels. 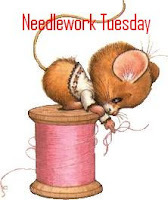 I am going to mix in a few additional fabrics and set to work. Guess I need to choose a pattern. I have been cutting strips for my first jelly roll quilt. Since I am in need of more variety, I bought this package. 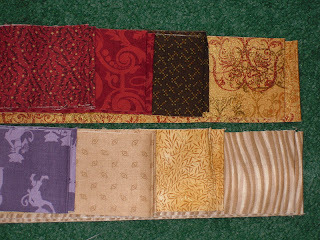 It has 2 each of 8 different fabrics. 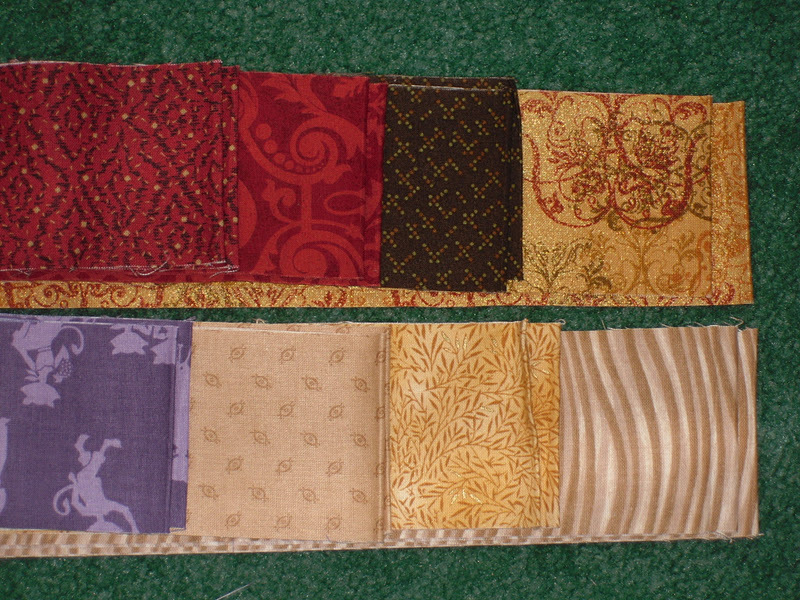 I am going to use them in the "Jelly Roll Quilt" that starts with 40 2 1/2 inch strips. Check out this video. The duplicates I'll trade with mom. 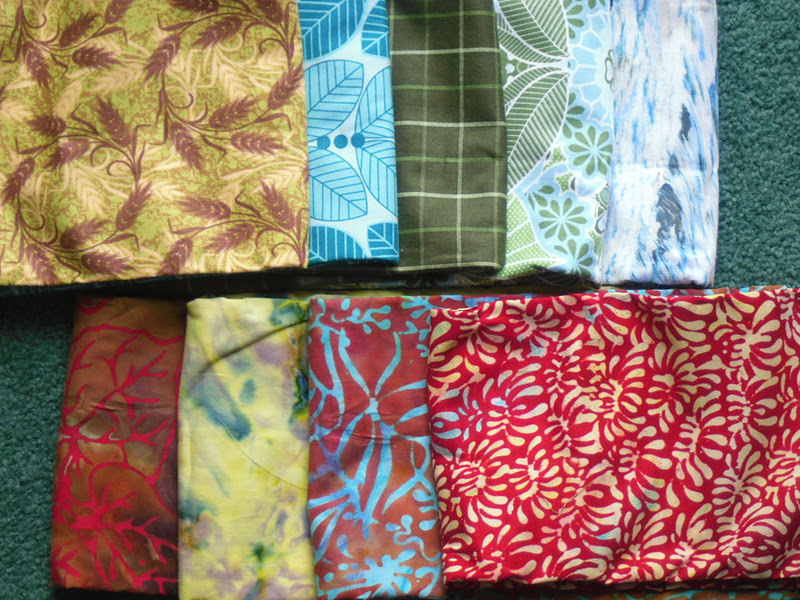 I also bought a number of clearance 1/2 metre pieces. No specific project, I just liked the colours and patterns. Should you find yourself in this area of Ontario, be sure to drop into The Marsh Store and say Hello to Shirley. How did you all do on your projects this past week? Any one else working on stockings? Be sure to visit over at Lit and Laundry and check out the cool Halloween Embroidery. Not quite a stocking, but then again, who needs a stocking when a pumpkin basket will work. Your scarf looks great! You really caught up quickly. I like how you adjusted your socks for the lack of yarn. They look as if that was a design choice and not simple practicality. Very nice. 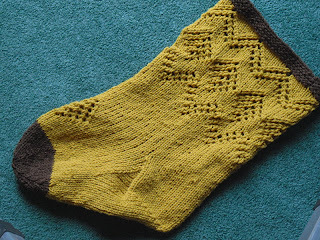 The socks are very pretty and cool (if woolen socks can be that), but they look very small. Hi Dorte, the stocking is actually quite large, though it does look rather short in the foot area. Daughter was wearing hers as a hat yesterday. Their old stockings are very small, I could barely shove the Toblerone bars inside. Love your stockings! 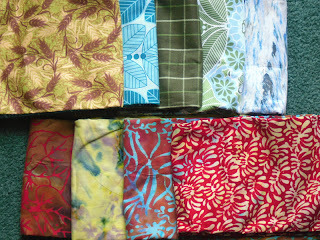 Great fabrics.I love the blue leaves on the white background. What great projects you have going on! I've been doing more knitting and crocheting lately so I'm going to have to check in here more often to see what you are working on!